In this episode we had a special guest. Michelle Santiago and I spoke about our most recent accomplishments and all we have been working on, in preparation for Formé’s appreciation month. “Let us be grateful to people who make us happy; they are the charming gardeners who make our souls blossom”. Marcel Proust. When was your last visit to the dentist? Most of us avoid those necessary trips to the dentist because of excessive cost…But fortunately we have a solution. Formé Medical Center has teamed up with Touro Dental College, to offer affordable dental treatments. We visited Touro Dental College in Hawthorne NY with the Vice Dean, Dr. Edward Farkas. Learn about the wonderful resources available to you to ensure your good oral health! Did you ever imagine that you could name your own price for healthcare? On this episode of Reflect and Reset with Maria and Gina Dr. David Berman, Founder and CEO of Slingshot Health, talks about an innovative new company that lets you name your price for healthcare services. 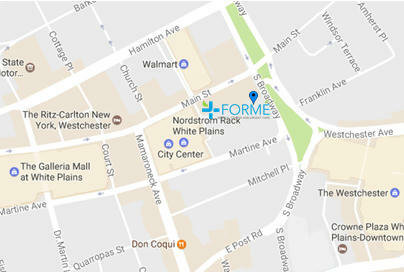 Formé Medical Center and Slingshot have teamed up to bring you high-quality healthcare that won’t break the bank! The Trump Administration Officials announced on September 22, 2018, a new Executive Order with proposed changes to the definition of public charge as basis for denying admission, green cards and visas applications. If this rule is implemented it would prevent immigrants from securing lawful permanent residence and would prevent them remaining with their families in the USA simply because they receive some type of health care support, nutrition assistance or other vital services. When is this change going to be in effect? The Order at this moment is only a proposal and it requires execution and implementation. It will take some weeks before the proposed Order goes into effect, but the public will have the opportunity to prevent the proposed Order from becoming law by submitting comments once the proposed Order is published in the Federal Register. Supplemental Security Income (SSI), Medicaid (with limited exceptions for Medicaid benefits paid for an “emergency medical condition,” and for certain disability services related to education), Medicare Part D Low Income Subsidy, the Supplemental Nutrition Assistance Program (SNAP, or food stamps), institutionalization for long-term care at government expense, Section 8 Housing Choice Voucher Program, Section 8 Project-Based Rental Assistance, and Public Housing. The first three benefits listed above are cash benefits that are covered under current policy. My recommendation is for individuals to get as informed as possible and seek legal advice before receiving public benefits to avoid possible future complications. It is important to understand that the proposed rule does not include some benefits that U.S. children are entitled to receive like prenatal care, WIC, or other health- or food-related benefits. In addition, the public should be preparing to comment on this proposed Order and be ready to inform the administration that the implementation of this proposed Order will weaken our country by threatening the health and well-being of families around the country. October is breast cancer awareness month, so today we will be sharing information on cancer prevention resources that are available at no cost to the community. We will be joined by Lea Cassarino, the Director of the Cancer Services of the Hudson Valley, who will provide very important information about programs available and how to access them.